Track days at Brands Hatch, Mallory Park and Snetterton. Homepage. This page: An invitation to drive one's own car at a top British motor-racing circuit in the 1960s. Drive at Brands Hatch, Mallory Park or Snetterton. 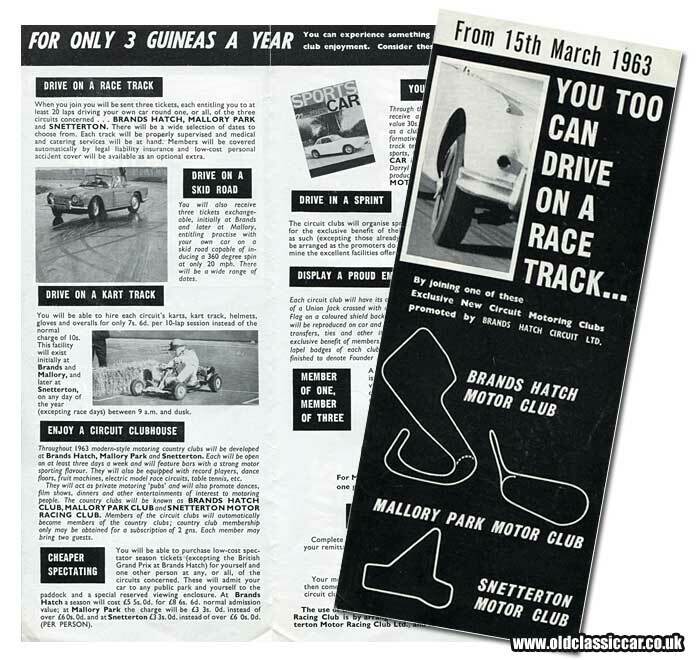 Track days aren't a recent phenomenon, as this leaflet dating to 1963 ably demonstrates. Published on behalf of Brands Hatch Circuit Ltd, it invited wannabee Jim Clarks and Graham Hills to take their car on track, and push it to - and usually beyond - its limits. Then as now, these organised gatherings took place throughout the week at many British circuits, designed to allow the enthusiastic driver to drive their car with gusto and verve, without having to worry about catching the eye of the boys in blue, or re-modelling the local scenery should (to paraphrase a former BBC F1 commentator) ambition triumph over adhesion. From the 15th March 1963 you could opt to take your machine on high-speed circuits of Brands Hatch, Snetterton or Mallory Park. Prior to booking though you needed to join the Snetterton, Brands Hatch or Mallory Park Motor Club, depending on your preference, for which a charge of three guineas (£3 3s 0d, or £3.15 pence in new money) was charged for 12 months membership. The cover of the leaflet incorporates diagrams portraying the layout of each circuit, along with a sneak preview of a Mk2 Jaguar - on wires note - being driven with admirable alacrity. New members would receive three tickets in the post, each of which entitled them to twenty laps of a circuit, or circuits, of their choice. Professional supervision, in addition to suitable medical and catering facilities, would be laid on, as would insurance. To learn about the delights of over- and under-steer in a controlled environment, three further tickets could be utilised at Brands Hatch (and later Mallory) to access the "skid road". Here you could inflict 360 degree spins and slides onto your car at a mere 20mph or so, all without risk of clobbering lamp posts, postmen, cyclists and telegraph poles. A driver, with his lady passenger for company, is shown demonstrating the skid road in his Triumph TR4 sportscar. To really get to grips with car control, it was possible to hire engine-driven karts, gloves and overalls for 7s 6d and head out for 10 laps of a kart track, initially at Brands and Mallory only. Should all this high-octane activity sound a little too much like hard work, the circuit clubhouses may well have appealed. Stocked as they were with dance floors, fruit machines, record players and electric model racing circuits, a grand time could be had, in the warm and away from the vagaries of the British climate. No doubt many refreshing beverages were supped after an enjoyable day testing the limits of road cars out on the race circuits. If all these perks of membership weren't enough to get you signing on the dotted line and handing over your £3.15p, there were further benefits to enjoy. Season tickets to attend motor races could be purchased at reduced rates - although the British GP at Brands wasn't included. A copy of magazine "Sports Car" would land on your doormat every month, not we're told just a clubby magazine, but "... a lively, informative magazine full of road and track tests of modified and production sports, GP and saloon cars". Each club would also organise sprints, driving tests and hillclimbs exclusively for that club's membership. Proud members could also opt to buy a number of track-specific goodies. These included lapel badges, car badges, ties and transfers - no doubt many were in evidence at race meetings in 1963 and beyond. Perhaps someone reading this remembers joining up and taking their car(s) to one, or more, of the venues mentioned above? If any personal anecdotes relating to these track days turn up, I'll add them to the site. Return to the Motoring Collectables section to find more old-car related items.